Kiwi quality you can trust! Christie glasshouse and garden sheds are built to withstand extreme weather conditions and years of hard work. Made in Dunedin by our dedicated team who build in heavy gauge Zincalume by New Zealand Steel, Allan guarantees the workmanship and materials for 15 years. It’s called Allan’s 15 Year Tick. Allan challenges you to compare the qualities and features of Christie glasshouses with overseas made “budget” brands. 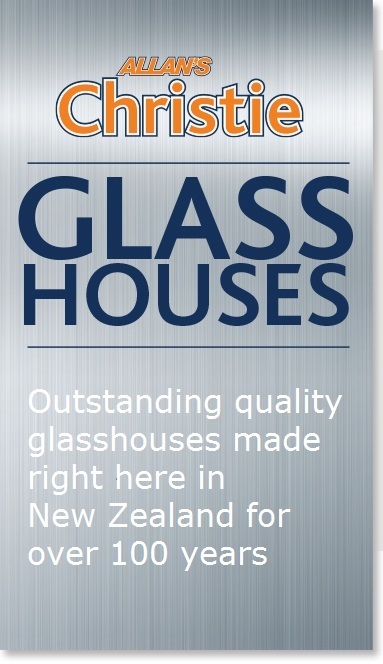 In 1912 J&T Christie Ltd of Dunedin produced its first glasshouse. Measuring approximately 18ft x 10ft (5.5m x 3m), it was custom built for Mr. W.A. Scott, a bicycle shop proprietor, and it was still growing food 70 years later. 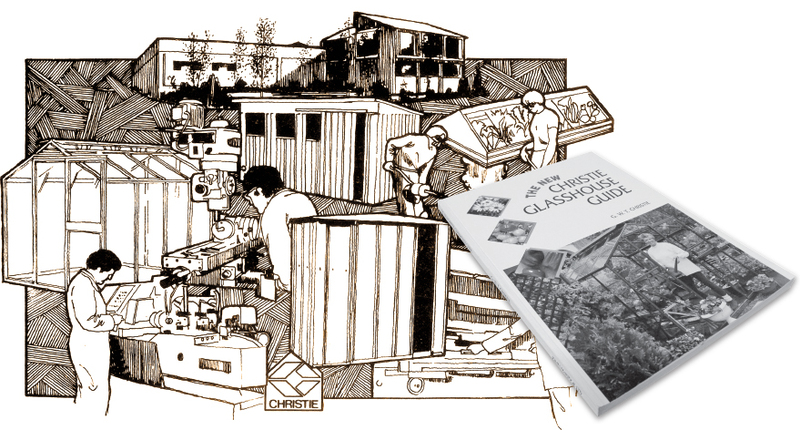 J&T Christie, which was founded as a plumbing business in 1881, went on to become New Zealand’s largest manufacturer of glasshouses, garden sheds and sheetmetal accessories. In 2012, the Christie business was taken under the wing of Allan’s Engineering and Sheetmetal Services of Dunedin. CHRISTIE HAS BEEN THE FIRST CHOICE of New Zealand and Australian gardeners for over 100 years. That’s because when you buy Christie you know you are buying quality based on the traditional family values of providing top value for money. 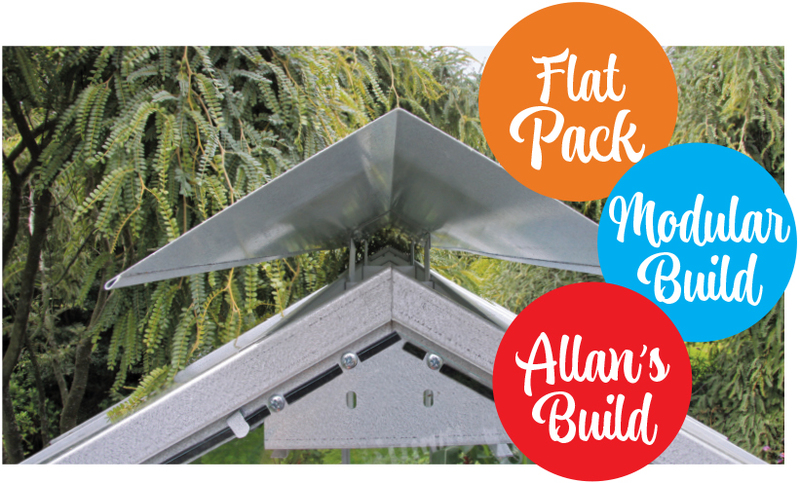 Full range of Allan’s accessories, including guttering, irrigation, shade cloth, staging and planter boxes. Local availability of replacement parts, including panes of glass to fix that “oops” moment. 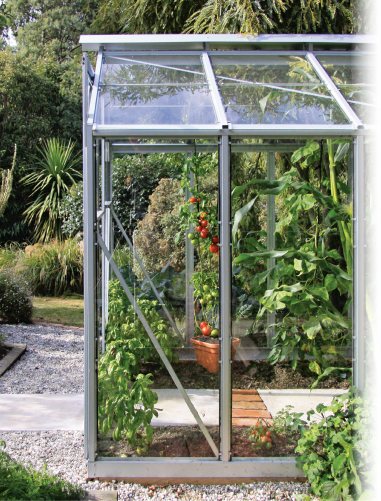 MATCH YOUR GARDEN ENVIRONMENT with a Christie glasshouse in your choice of colour. 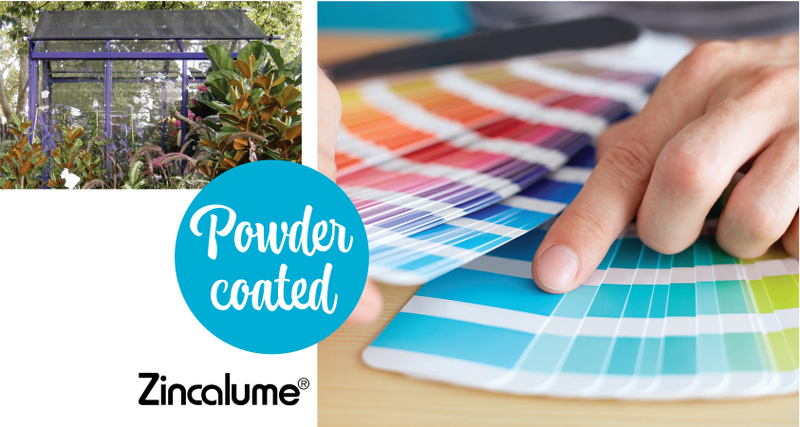 Allan’s can supply a Christie glasshouse in standard, non-rust zincalume, or you can have some fun and choose a colour. Be bold. Match your house colour. Or blend in with the colour of your garden. The plummy coloured glasshouse shown here was a display model at a Melbourne garden show. It features a retractable shade cloth option for those super sunny, super hot environments. CHRISTIE ARE SO EASY TO ASSEMBLE! Our Modular Build option is delivered in pre-assembled panels, not in bits, and comes with simple to follow instructions. All materials are supplied, including an optional timber foundation. All it takes is a couple of people, a step ladder and a few simple tools. You choose how you want it built. There are three options. Modular Build: Pre-built walls, door and roof. Simply stand up on the foundation, bolt together and install the glass. Flat Pack: Delivered as boxed parts. Select models only. 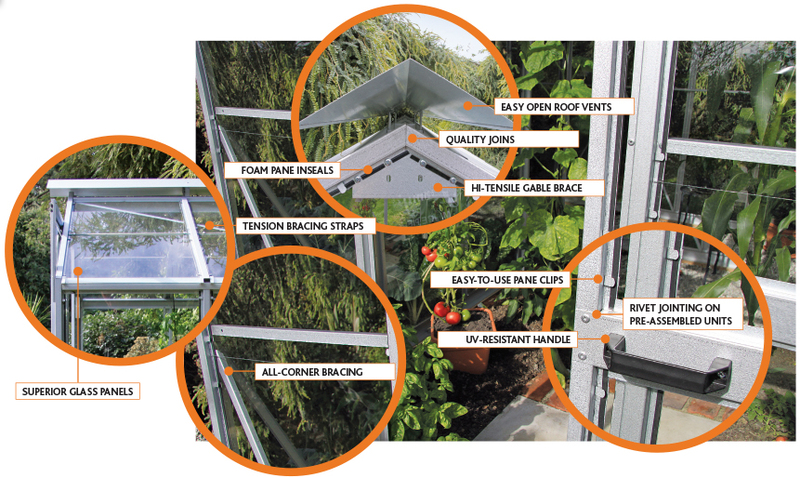 Allan’s Build: We will deliver and assemble your glasshouse, anywhere in Otago or Southland. 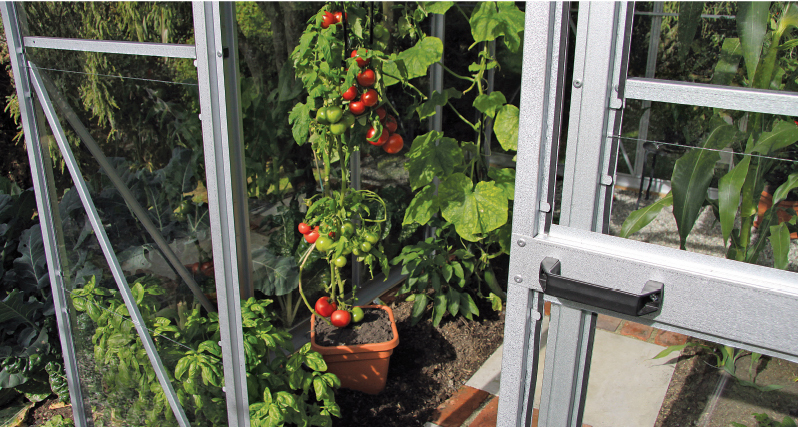 A Christie glasshouse will increase your gardening pleasure. 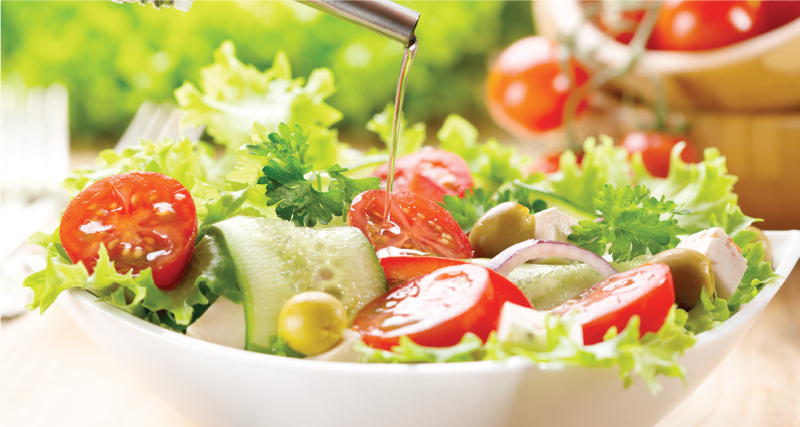 You will extend your growing season, grow more food faster and grow a much larger variety of produce than you can outdoors. You will be amazed at what you can grow, even in the most challenging southern, or high country climates. 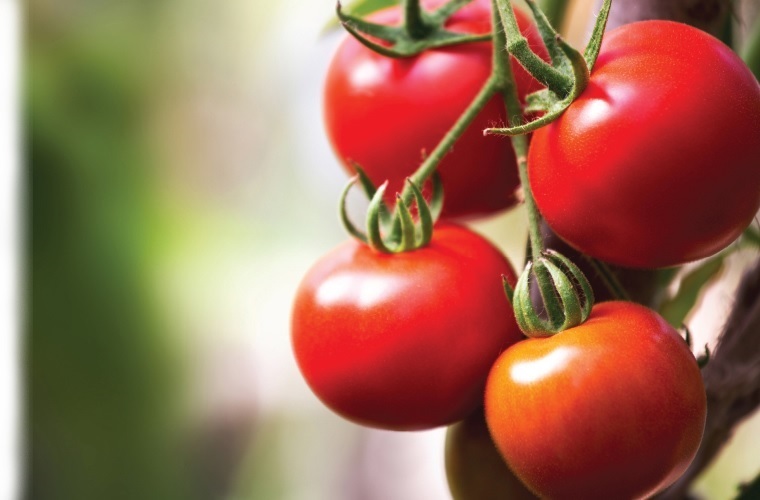 Tomatoes, chillis, capsicums, cumcumber, lettuce, sweet corn, kumara and hot climate herbs like basil and coriander. Mushrooms, grapes and many exotic flower species also thrive in the micro-climate of a Christie glasshouse. And a Christie glasshouse is perfect for propagating from seed.